Photo: Morven, ca. 1821, Route 20, Simeon, Albemarle County, VA. Listed on the National Register of Historic Places in 1973. Photographed by User:Lzgoss (own work), 2009, [cc0-by-1.0 (creativecommons.org/publicdomain/zero/1.0/deed.en], via Wikimedia Commons, accessed December, 2013. Albemarle County Courthouse is located at 401 McIntire Road, Charlottesville, VA 22902; phone: 434-296-5841. People have lived in Albemarle County for more than 12,000 years. The first inhabitants were Native Americans, whose long history in the County is preserved in archeological sites which lie buried in the floodplains of rivers and streams and in the surrounding mountains and valleys. These archeological sites are highly variable, ranging from rare remains of the 12,000-year-old hunting camps of the first inhabitants to the dense accumulations of pottery fragments that mark the former villages of the Monacan tribe. The 600-year period prior to the founding of a permanent European settlement at Jamestown in 1607 witnessed dramatic and relatively sudden cultural changes in the Native American population in the Albemarle County area. Among the recognizable changes were an increase in population, an increase in the size and permanence of villages, and the growth of an agricultural economy to augment traditional hunting and gathering. Additionally, the Monacans established burial mounds where they interred the remains of thousands of individuals. In the mid-18th century, Thomas Jefferson investigated one such burial mound between the forks of the Rivanna, an exploration later noted as the first systematic archeological excavation conducted anywhere in North America. European settlement of the Albemarle County area began in the late 1720s, when three land patents were successfully settled on land suitable for farming along the Southwest Mountains and the James and Rivanna Rivers. Over the next twenty years more settlers arrived, and in 1744 Goochland County was divided and its western part became the new county of Albemarle. The initial County boundaries encompassed a far larger area than present-day Albemarle, extending southward to the vicinity of Lynchburg. They included the current counties of Albemarle, Amherst, Appomattox, Buckingham, Fluvanna, and Nelson, as well as a portion of Campbell County. The county seat was established at Scott's Landing on the James River, about a mile west of today's Scottsville. The early settlers were a mixture of tobacco planters from the Tidewater region with Scots-Irish and German farmers moving east over the Blue Ridge Mountains from the Shenandoah Valley. The former tried to transplant the slave-run tobacco plantation system to the southern and eastern parts of Albemarle, while the latter operated family-run farms raising cattle and grain in the northern and western areas. An example of a resource from this time period is the Buck Mountain Church. In 1761 the large area south of Albemarle's current boundary was split off, and that part of Louisa County which extended to the Blue Ridge was added to become the northern portion of the now much smaller Albemarle County. As a result, Scott's Landing was no longer a convenient location for the courthouse. The town of Charlottesville was therefore established in 1762 near the new geographic center of the County, adjacent to the Three Notch'd Road linking eastern Virginia to the Shenandoah Valley. Albemarle County's current boundaries were attained in 1777, when Fluvanna County was formed from the easternmost part of Albemarle. During the American Revolution, Albemarle was spared the effects of major military campaigns, although its citizens contributed both politically and in military service. By the close of the Revolutionary War, the County had been transformed from a frontier settlement to an established community. Its geographic and political boundaries had stabilized, its new county seat was developing, and it had secured trading and communication links with the rest of the new nation. Examples of resources from this period are Findowrie, Solitude, Everettsville Tavern, and the early parts of Piedmont near Greenwood, and of Castle Hill. By the end of the 18th century, wheat had become the County's primary agricultural product, although tobacco was still widely planted, and the slave population continued to rise until 1850. Farms and plantations remained the primary economic factor, but small industry (tanneries, sawmills, and flourmills) had begun to grow. Internal improvements fostered the expansion of towns by making the Rivanna River more navigable and upgrading key roads into turnpikes. The University of Virginia admitted its first students in 1825, and the builders Thomas Jefferson recruited for its construction helped disseminate his ideas. 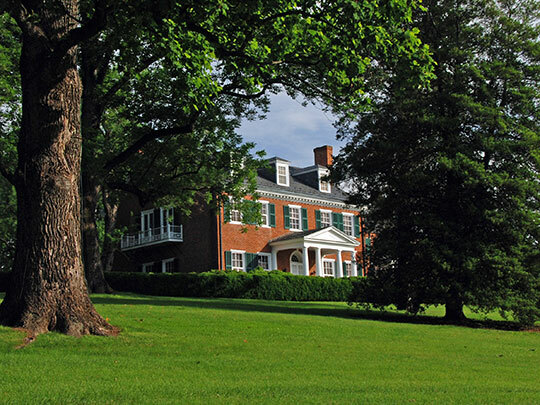 The Jeffersonian architectural influence, initially evident throughout Central Virginia, has since spread to other parts of Virginia and the nation. Examples of resources from this period are Monticello, Redlands, Woodstock Hall, Carrsbrook, Brookhill on the South Fork Rivanna River, Plain Dealing, Tallwood, Sunny Bank, Morven, Malvern, Mountain Grove, D.S. Tavern, Black's Tavern, Merrie Mill, Cove Presbyterian Church, and Shadwell Canal locks and dam. Beef cattle production began to rise by the mid-nineteenth century, although grain and tobacco continued to dominate agricultural economics. Railroad construction in the late 1840s changed the County's culture and economics. Towns that had prospered when water was the primary means for moving goods began to decline, while new communities grew around railroad depots. As the terminus of the railroad to Orange County, and later through the Blue Ridge to the Shenandoah Valley, Charlottesville's progress was assured. Examples of resources from this period are Cliffside, Old Hall, Arrowhead, Pleasant Green, the Cedars, outbuildings at Cloverfields, Clover Hill Farm, Kinloch, Scottsville canal warehouse, Piedmont Store, Grace Church, Mt. Ed Baptist Church, and the Blue Ridge Mountain tunnels. The Civil War, like the Revolutionary War, brought few military encounters to Albemarle, although many sick and wounded soldiers were nursed here. Communities were not untouched by the war, however, since many of the County's husbands and sons in military service became casualties. During the last months of the war, Union forces marching from the Shenandoah Valley toward Richmond occupied Charlottesville. The town and the University were largely spared, but there was considerable economic destruction along the route of march. An example of a resource from this time period is the Batesville Methodist Church. In the first two decades after the Civil War, freed blacks were a majority of the population, and they became farm tenants, sharecroppers, or small tradesmen such as blacksmiths, cobblers, or carpenters. These freed slaves founded several rural black communities such as Bethel (now Proffit). By the close of the nineteenth century, outmigration of blacks to better opportunities in northern cities caused a population shift back to a white majority. Black communities and institutions persisted despite this population decline, however, providing historically significant examples of houses, churches, schools, and lodge halls which illustrate the African-American experience in Albemarle County during this period. Railroads continued their expansion, contributing to continued economic progress and the growth of villages around rail depots, but the advent of the automobile in the early twentieth century marked the beginning of decline for some rural villages. Farms were smaller, more numerous, and more diversified. Orchards, vineyards, and the raising of beef, dairy cattle, and sheep replaced large slave- operated wheat and tobacco farms. Some rural families began to move to Charlottesville, attracted by job opportunities and urban conveniences. By 1888, Charlottesville had grown sufficiently to incorporate as a city. Around the turn of the century, capitalists from outside the County began to buy old estates as part-time residences, renovating historic homes already there or building grand new ones. This preserved or created some of the County's finest architectural resources, and protected some of its rural landscape. Examples of resources from this period are Kirklea, Seven Oaks Farm, Cobham Park, the worker houses at Alberene Quarry, Esmont National Bank Building, Miller School, Green Teapot Hotel, Advance Mills truss bridge, Nortonsville Store, Johnson's Store, Evergreen Baptist Church, Mt. Calvary Baptist Church, Dr. Kyger's house and office, Crozet Cold Storage, Crozet Hotel/Hardware, and the original Crozet Railroad Depot. Rail service was frequent and reliable in the early twentieth century, but all-weather roads maintained by the state did not appear until 1922. By the early 1930s the state had established a network of roads in the County. This coincided with the beginnings of a tourist component in the area's economy, aided by the opening of Monticello to the public in 1924. Better roads and more families with automobiles spawned housing subdivisions on farms that once surrounded the urban core of Charlottesville. This phenomenon began early in this century and has continued since then, with an upsurge after World War II and again in the 1970s. The number of farms in the County peaked at 3,379 in 1924, and as recently as 1940 over half the population was involved in some form of agriculture. By 1970, however, only 847 of the County's labor force of 14,208 were full-time agricultural workers. Agriculture, the traditional economic base, remains a significant land use, but has been replaced as the principal employer by a combination of education, tourism, and small manufacturing and service industries. Examples of resources from this period are Tiverton, Blue Ridge Farm, Rose Hill, Casa Maria, Farmington Subdivision, Sunset Lodge, Town and Country Motel, Stony Point (High) School, and Cobham Park gardens. † County History below was adapted from: County of Albemarle Historic Preservation Plan, Albemarle County Historic Preservation Committee, 2000, Charlottesville.